January 20, 2006 - As we discovered in 2005, the suits have a 'thing' for the urban street life. They know that kids are eating up rap and hip hop music and the lifestyle that goes right along with it, so naturally they want to capitalize on it while it's hot. The suits are also quite fond of the idea of creating the next popular knock off of the Grand Theft Auto franchise because frankly, their trophy wives have been asking for a new pair of diamond studded Porsches and these hootchy mamas are hard to please at the best of times. At the end of 2005 we suffered through 50 Cent: Bulletproof, True Crime: New York City, 187: Ride Or Die, Urban Reign et al and now we get to kick off 2006 with 25 To Life. I'll give the suits at Eidos credit; they had a little more vision and ambition when plotting out the execution of their game when compared to the aforementioned list of disasters. They wanted to give the GTA fans a world in which they could kill each other online and for the most part they've succeeded. The online portion of 25 To Life isn't bad; it's not deep by any stretch nor does it look particularly wonderful, but you and your pals can run around the city and shoot each other online and I bet some of you will really like it. The single player game is as forgettable as they come and I'd suggest ignoring it all together, but if you want to unlock all of the multiplayer goodies, you'll have to beat the game. I have come to the conclusion that it won't be long before we see obscenities mapped to the controller to allow players to drop the F bomb whenever they want (25 To Life is close - a taunt feature is mapped to the D-Pad, but how long before any obscenity can be configured to the face buttons?). Developers are becoming so fascinated and preoccupied with adult language due to the allowances of the M rating that they're mistakenly confusing it with gameplay. Swearing isn't gameplay nor does it make up for a lack of it...even if you geniuses eventually map it to the controller as I already predicted. It's lazy developing, much like a comedian peppering his act with obscenities to compensate for weak material. In case you haven't noticed, expect to hear a litany of curse words both offline and online while playing 25 To Life....because the kids you'll be playing with online love to shout whatever they've learned from the other gangsta games and rap music. Will someone please invent a machine that checks your IQ before you're allowed online? Thanks in advance motherf******! Oops! The single player in 25 To Life focuses upon three different playable characters each with their own ulterior motives for moving towards their eventual destiny. Andre Freeze Francis is a gangbanger who just can't get out of the gangsta life, even though his wife desperately wants him out. But just when you think you're out...they pull you right back in again. Where have we heard that before? The argument with Freeze's wife is nothing more than the impetus to go out and shoot everything that moves. As you progress you'll character hop into those who have sworn to uphold the law, those who don't care for the law and those who are neither good nor evil. I guess the character switching might be considered interesting if it hadn't already been done far better in other games, but at least it gives you the shallowest of reasons to shoot the guys whose side you were just on. Eidos grants you a decent amount of control but after you play for awhile you'll realize you won't need most of it. You can crouch (as depicted on the box shot), jump, melee, shoot, grenade toss, taunt, reload and lean out from behind cover to shoot. The lean move is quite touchy and mostly ineffective. It's hard to line up the character to the exact point where you can lean around corners. It doesn't appear that the game "snaps" you to the corner so you'll often find yourself leaning too far out which leaves you wide open to take a shot in the head. I also discovered that the collision detection is faulty as I was being shot through the wall I was hiding behind. That's never a good sign. A gameplay mechanic that works well in theory (and other games) but not so well in actual execution is the hostage taking. Taking a hostage extremely limits your moves and it doesn't appear to be in the best interests of other players to save the hostage - so everyone is a freakin' target. I've never taken someone hostage before, but if I did it would be for insurance...you know....insurance that people with guns don't start shooting willy nilly in my direction. That notion appears to be lost on the AI and those online. You'll find ducking for cover is more of a necessity than it is a viable game mechanic because the enemies in 25 To Life are so hellbent on your destruction that they've lost any sense of security for their own safety. Most of them run around shooting in your general direction until you manage to kill them. Killing them wouldn't be so bad if it wasn't so hard to aim. The targetting reticule is very hard to see which makes getting a bead on a frantically moving enemy almost impossible. You'll also discover, much to your chagrin, that enemies can take all kinds of punishment to their person unless you manage to get off a headshot. Good luck with that pipedream. What you will notice is blood, and lots of it. Blood and swearing. That's what this game should have been called. I'm assuming everyone in the game is a hemophiliac as they just never seem to stop gushing precious life liquid. I guess Eidos forgot to program blood clotting. Every so often you'll use a trail of blood to locate an injured character and I have to say, that at least gave purpose to the act of pumping out of the red stuff. Visually the game just doesn't cut it and looks like it was geared to compete with first generation PS2 titles. I can only surmise that the low quality visuals that permeate the offline game are there to enhance the playability of the online game. If you can live with 25's stilted jerky animation (ala Syphon Filter PSone era) you will no doubt get off on the urban jungle settings of the online game. They're actually pretty good and definitely a fun playground to run around in. Once you've exhausted yourself playing the single player game (or much sooner than that), be sure to investigate 25 To Life's entertaining online mode. Since the concept of making a GTA game online was no doubt the impetus for 25 To Life, you can almost throw away the flawed single player game in favor of the online action. 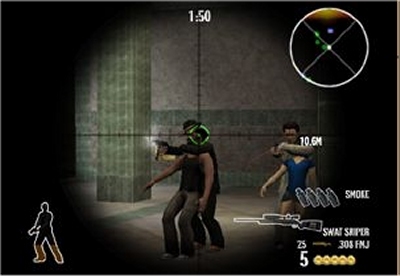 Unfortunately you might have to wait a long time before you locate other players to shoot at, but once you do, you'll realize that this is definitely the mode Eidos intended for the spotlight. Granted online isn't perfect but the game instantly becomes far more interesting because you're no longer playing against the ridiculous AI found in the offline game. As I already mentioned you'll have to settle for playing against younger kids (who shouldn't even have this game...hello? Parents? Anyone? Buehler? Buehler?) who scream, threaten, yell and swear like the dickens but even if they aren't your intellectual equals, the gameplay still manages to shine through the blue cloud of cursing. That's not to say 25 To Life is going to win any awards here, far from it, but if more people were playing online (XBL recommended over PS2 online) I could see where some...ahem...older gamers...who love grisly violence would get off on it. At the end of the day, 25 To Life just isn't worth it. It's a full priced game that feels rushed and is lacking in many important areas which I've outlined above. Even if you're all about the online play, the offline mode suckage is turning people off faster than you can say "really bad word of mouth" which means it isn't going to get any easier finding people to play against. Eidos has released some worthy products recently (Total Overdose, TimeSplitters: Future Perfect, Project Snowblind, Lego Star Wars) but this is more along the lines of that stinkbomb Tomb Raider: Angel Of Darkness. If you're curious, by God man, rent as headshots and gore do not a good game make! Almost on par with first gen PS2 titles which just isn't acceptable in this day and age. Control is responsive but certain mechanics such as leans aren't executed with precision. The music is good, sound effects kind of weak, voice acting is presented in Swear O Rama. Online is far more valuable commodity than offline, but it will be slim pickins trying to locate people to play against. 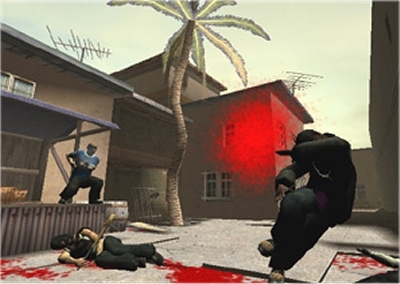 Eidos is hoping to make a big splash in 2005 with it's online third person action title 25 To Life. Up to 16 players will be able to battle on the mean streets as either thug or law enforcement. If it sounds like a dream come true as well as something Rockstar should have incorporated into its GTA series years ago, you're probably right. 25 To Life even has a single player mission where you'll have to tough it out on the street as a rising thug looking to make a name for himself. Promising a healthy (or unhealthy...) assortment of weapons and interactive environments, 25 To Life might just be what the doctor ordered next year, after you've beaten San Andreas and wouldn't mind tearing up some online time without being relegated into a FPS game. We've been told barking dogs, car alarms and innocent bystanders will give your position away if you're trying to be stealthy which hopefully reflects the realistic environment Eidos is striving for. As well, Eidos is also promising complete control over your online persona with a very robust character creation tool. Currently there is no word on whether vehicles will be available to drive in either online of offline play. Currently the screens look as though most of the gameplay takes place at night but we'd hope there would be some daytime action in there as well. 25 To Life could be a very important game if Eidos pulls it off next year. Add some vehicles and you just might have yourself a Grand Theft Auto killer that you can play online. Eidos needs a hit and we're hoping this one is a success. As long as it doesn't play like State of Emergency everything will all right in the world. Battle online with up to 16 players in this intense urban battlefield. Establish and defend your turf or uphold the law and exchange fire against your opponents using the USB Headset! Compelling single player game-play. Experience the world of 25 To Life as you try to survive life on the grind as a rising Thug forced into life threatening situations. 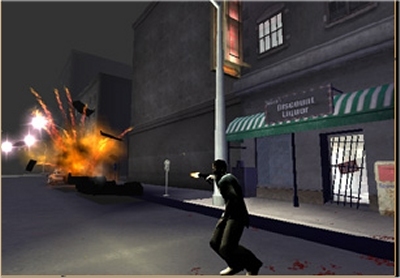 Highly interactive urban environment delivers a superior and realistic game-play experience. Car alarms, barking dogs, pedestrians are few of the items that may give your position away. Fully customizable character system gives you the freedom to define your looks and style. Display your ranking by unlocking and customizing your gear with the latest threads! Robust weapons arsenal includes both lethal and non-lethal ways to take down your opponents.